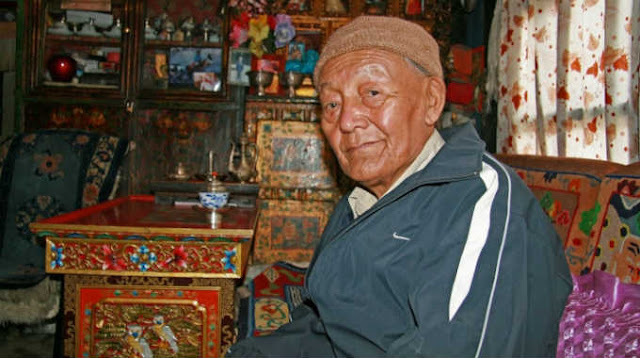 Jigme Dorje Palbar Bista, the last king of the ancient Buddhist kingdom of Upper Mustang died on Friday in Kathmandu at the age of 86. Prior to stepping down from the throne eight years ago, Bista had reigned over the isolated Himalayan region high on the Tibetan plateau for more than 50 years. Ceremonies were held at temples in the Nepalese capital to mark his passing. His remains are being held at a monastery at Bauddha, where final rites were held today. ​Upper Mustang, formerly the kingdom of Lo, which makes up the northern two-thirds of Nepal’s Mustang District, was annexed by Nepal in the 18th century, although the king was permitted to retain his centuries-old title. Mustang's status as a kingdom ended in 2008 when Nepal abolished its own monarchy and became a republic. The region was a restricted demilitarized area until 1992. While it is now open to outside visitors, access is still strictly regulated. This relative isolation had the unintended side effect of helping to preserve the region’s culture, historically closely linked with that of Tibet, creating a time capsule of Tibetan heritage and Buddhism. Born in 1930, Bista, who succeeded his father Angun Tenzing Tandul as king in 1964, spent the majority of his life in the walled capital of Lo Manthang, where he acted as a spiritual leader to the local Loba community and used much of his power to strictly preserve Tibetan Buddhist culture in the region. He supported the resistance against Beijing's occupation of western Tibet and at one time allowed Upper Mustang to be used as a base in support of a CIA-funded guerrilla campaign that sought to oust occupying Chinese forces from Tibet after a failed uprising in 1959. Bista relocated to Kathmandu more than a year ago as a result of health issues, including heart and kidney problems. The royal family traces its lineage back to Ame Pal, a warrior and devout Buddhist from Western Tibet, who founded the independent kingdom in 1380 and oversaw the construction of much of Lo Manthang and the kingdom of Lo. Lo Manthang, home to the Loba people, the original inhabitants of Mustang, who are culturally and linguistically more closely related to Tibet than Nepal, is today relatively unchanged, considered by some scholars to be the best-preserved medieval fortress to the world, and is a UNESCO World Heritage candidate. The kingdom once occupied a strategic position on the ancient trade route between Tibet and India, which also allowed lamas from Lo to study in Tibet and exposed the city to religious teachers from both directions. A new road linking the ancient Buddhist kingdom with China and India was completed in 2014, offering direct access to the region direct that was formerly shielded from the modern world by a ring of mountains and canyons.